Who Will Be Our RDA Online Dressage Champions? Since August 2017, riders from across the country have been riding in our monthly RDA competition classes to qualify for the Online Championships. The qualification period has just closed and invitations have been sent to all qualified riders. The Online Championship Show takes place during May 2018 and the schedule is ready and open for entries. 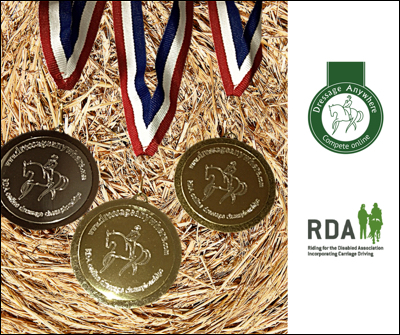 First, second and third placed riders will each receive a Championship rosette and a gold, silver or bronze medal, due to be awarded at the RDA National Championships, Hartpury this July.